Richter has served since 2012 as a part-time trumpet instructor at IU East. His full-time job is as a player and master sergeant in the U.S. Air Force. 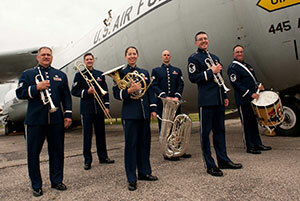 Richter will perform with the Wright Brass Quintet in a concert that’s free and open to the public. It is scheduled to begin at 7 p.m.
Jessica Raposo, assistant professor of music at IU East, is grateful for that opportunity in many ways. For more information about the Band of Flight, visit bandofflight.af.mil. Richter lives in Dayton with his wife and two young children. He grew up on Long Island, N.Y., and graduated from Duquesne University in Pittsburgh, Pa., before auditioning for and then joining the Air Force in 2001. “Bandsmen go through basic training, just like anyone else,” he says. He was stationed in Georgia and Germany before coming to Dayton four years ago. Soon after, he started teaching part-time at Earlham College and IU East. He heard about the opportunities through a previous band member. Other performers in the quintet include Tech. Sgt. Cheryl Przytula on trumpet, Staff Sgt. Renee Parcell on horn, Senior Airman Ainsley Davis on trombone, Airman 1st Class Justis MacKenzie on tuba and Airman 1st Class Chris Hanson on drums. Parcell also has taught at IU East.